The Marine Corps Officer cuff links are worn by male Officers when wearing the Blue Service “A/B” Blue-White Dress “A/B,” and the Evening Dress uniform. Male Officers also wear cuff links with the Service “A” uniform if they have opted to purchase the French cuff khaki shirt, which is authorized for wear both for duty as well as on leave and liberty; it may also be worn for parades and ceremonial events at the discretion of the commander. USMC Officer cuff links follow the same design parameters as the branch-of-service collar devices. They feature the USMC Eagle, Globe, and Anchor set on a gold background, with the Western hemisphere and the anchor rendered in gold and the Eagle, globe, and anchor rope in silver. This contrasts with cuff links worn by Staff Noncommissioned Officers (SNCOs), which are rendered completely in gold. Both Officer and SNCO cuff links are sold in pairs. 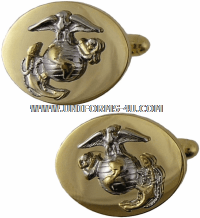 Along with shirt studs and necktie clasps, cuff links are one of the few distinctly Marine Corps uniform accouterments that is authorized for wear with civilian clothing.